I had a crazy dream last night. About an alternate reality? Or maybe just a made up-place. That dream had a giant empire, and everyone but the rich people worked in these giant solar farms, or factories. When the emperor died, it was believed that their soul transferred into a child, so every time an emperor died a bunch of children working in these solar farms that seemed to exhibit some traits of the dead emperor were sent into this giant desert. The last one standing would be the new emperor. Since this had been going on for hundreds of years, a rogue army of children who refused to play the game had been created and lived in the desert. They were called The Arms of The World. They were going to rise up against the empire and rescue everyone from the solar factories. The first draft was not started until November 3, 2015, under the temporary title, "Sun Thieves." 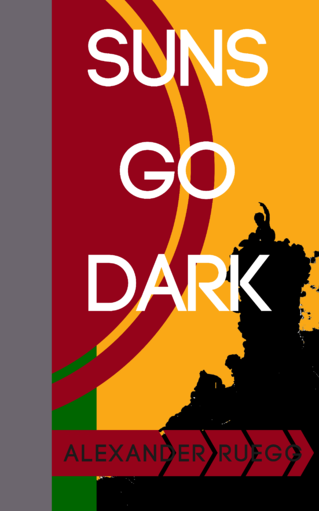 It was later renamed "Suns Go Dark" after the backstory was fleshed out in the book's first chapter during an email correspondence in July, 2015. As of 2016, the introductory chapter has been drafted, and six chapters have been planned to tell the story. 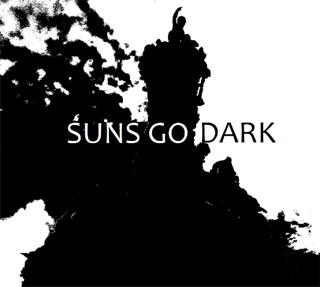 2016 Suns Go Dark cover art. Suns Go Dark takes place in an unknown galaxy on an orbital platform above, "a half-burned planet far past the known heliostasis." The orbital platform creates suns and is inhabited by trillions of humans, with unknown numbers dwelling on the planet below, called Goria. The platform and Goria comprise an Empire that covers the known pocket of space, currently in an era of peace. The space beyond the platform is dark. There are no visible stars. The Empire's most prominent purpose is to endure until its ruler is reincarnated. This reincarnation has occurred countless times in the past, believed to be a result of the peoples maintenance of the sun farms on the platform. The platform itself houses the First Four Lights, godlike suns that all light and energy are drawn, and the source of the Emperor's reincarnation abilities. The platform is described as brassy and fastened together with ancient, forgotten technology. It is a massive ring that encircles the planet, housing a total of 108 suns. The citizenry living on its surface is motivated by somehow contributing energy to the platform, measured in calories, joules, and megatons. All citizens living on the platform are tested for signs of royalty at a young age by Evaluators. For the first time in unknown generations, a potential reincarnation of the long-dead Emperor has been discovered in the teenage girl, Einie, who demonstrates unusual signs of molecular density. The Evaluators cannot rightfully judge if this is a sign of her royalty, as it has been untold eons since an Emperor has lived, and no existing records describe what the tests should reveal to indicate a proper reincarnation. While the platform is populated with primarily young laborers and candidates for potential reincarnation, the planet Goria is a paradise of aged retirees, rewarded with peace and relaxation for their lifetime of service maintaining the light. Its geography, flora, and fauna are as ancient and varied as the platform, suggesting innumerable peoples have lived and died on its surface. Virgil is a thief with a particular distaste for the maintenance of the sun farms. He defies the order of contributing his energy to the platform's continuation and despises the thought that he may one day retire to the planet below as his father once did. He pilots a small ship called the Eidolon to steal scraps off the platform to craft devices that can examine the horizon beyond the "the black end of space," which he believes contains something. Virgil's constant indifference to the platform's function leads The Author, a local judge, to place an impossible one trillion megaton energy-tithe on his head that he must fill in one hour or be turned into dust. Einie is a teenager that exhibits bizarre molecular composition during a regular evaluation meant to detect if she is reincarnated royalty. She and Virgil have been on several adventures in the past, almost always to her displeasure. The circumstances surrounding how Einie and Virigl met are unknown. An outlier amongst her peers, Einie openly hopes she is the reincarnation of the Emperor. This hope runs counter to Virgil's distaste for the platform's governing rules and mythology, yet he remains admirable toward Einie's confidence to know what she wants. The Author is the local authority governing the span of the platform that Einie and Virgil live on. Holding Virgil for his most recent infraction of exploring the area beyond the black end of space, the Author exacts a punishment upon the thief to deliver an impossible sum of energy. Suns Go Dark was originally based upon a bizarre dream. From there, it was brainstormed out over the course of five separate emails, available on the blog here. The main developmental point surrounded the number of protagonists. Keeping with the initial source, we knew from the beginning it would involve a reincarnation of the Emperor. The idea that there might be a conflict of succession was the first difficult point. In most books on Ghost Little, there is a single protagonist at the introduction, whereas Suns Go Dark has two: Virgil and Einie. To avoid science fiction and young adulter literature trupes, it was important that the protagonist not be a Joseph Campbell archetype, such as Luke Skywalker in Star Wars or Neo in The Matrix. Protagonists like Luke and Neo are much too predictable, resisting the call to adventure before being motivated by a lack of options, funneled toward a destiny. These characters lose agency and life without a human element. This character discussion can be seen in greater detail here. To distance the story even further from the usual format, the main protagonist was divded in two. Every age and gender combinations were considered, but we knew that one was the candidate for the reincarnated Emperor, and the other was not. Thus, Virgil and Einie shook loose. Having Einie be a young girl eager to engage with her own uniqueness in a setting like the sun farm was a straightforward choice. The sun farm is a place where everyone recognizes that the only way to live a decent life is to put in time with the establishment at a young age, and then retire to the promised paradise down on the planet below. Being as simple as possible works to one's advantage, producing and maintaining the suns, so Einie runs in wonderful contrast to that idea. Running contrary to the girl protagonists in young adult novels such as The Hunger Games or Divergent, Einie actively hopes there's something wrong with her. When she hears it's true, she's extatic. She has a kindred spirit in Virgil. He is a deliberate counter-culture force that wants nothing to do with the sun farms, whereas Einie wants to literally rule all known creation. Virgil is presented as a mad scientist waiting to happen, and we drew inspiration more from parodies of these tropes, such as Doc Brown in Back to the Future, or Gene Wilder's Victor in Young Frankenstein. He sees himself above his place in the story, demonstrates brilliance, but is literally charged with the crime of laziness. He needs a character like Einie to keep him tethered, fascinated by her eagerness to drive headlong into dangerous science-fiction settings that most other characters might resist. Virgil's background will be explored further in the second chapter. The history and mythology of the sun farm and the First Four Lights will also be pieced together in the second chapter. Even further in the story, Einie and Virgil will face opposition from another candidate who claims they, too, may be a reincarnation of the Emperor. The initial temporary outline from 2013 can be found on the blog here.